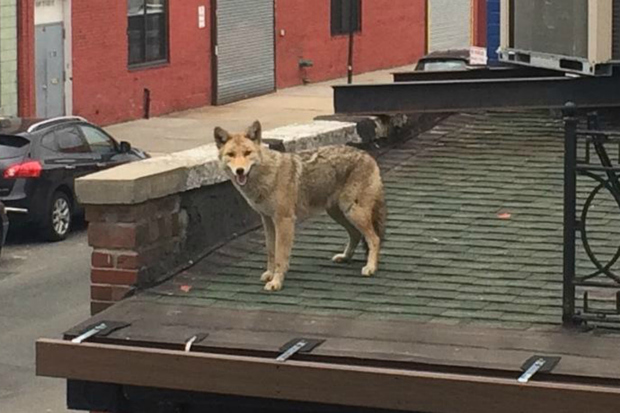 LONG ISLAND CITY — A coyote wandered onto the roof of a Long Island City bar Monday morning and stayed there for more than an hour before it fled into an old paint factory, witnesses said. Residents who live above LIC Bar, 45-58 Vernon Blvd., spotted the coyote on the roof and then texted owner Brian Porter to let him know the animal was up there. "It got a little nervous and kind of hunkered down underneath my air conditioning unit,” Porter said. "You could see that he was afraid." Porter said the coyote likely got onto the roof through a broken window pane in the Paragon Paint factory behind his bar. He said he could tell it was well-fed because of its size. “I've seen a number of coyotes. It’s definitely one of the largest coyotes I’ve seen," Porter said. "It was a well-fed animal." The LIC Post reported a veterinarian from Citi Vet climbed onto the roof to check to see if the animal was a dog or coyote, then retreated quickly when she saw the animal. Police and animal control came with tranquilizer guns to capture the coyote, who jumped back through the paint factory window and escaped, Porter said. The animal had been on the roof for about an hour and a half, he said. The NYPD did not have any information on the coyote. Animal Care and Control said they were sending a field officer to investigate the sightings.